After discussions with Federation, the Department has revised the 2019 HSC monitoring procedures and guidance material relating to these procedures, soon to be released. Federation pursued concerns raised by teachers in response to the survey and report Understanding work in schools — the foundation for teaching and learning that HSC monitoring procedures imposed significant workload demands and were managed in a way that was too time consuming and cumbersome. Teacher comments indicated concerns that there was a lack of clarity around what schools must do to meet both NSW Education Standards Authority (NESA) and Department requirements. The Department’s monitoring procedures now set out “what schools must and should do to comply with NESA in requirements for HSC credentialing”. The importance of these procedures is noted and there is a recognition that the administrative work associated with “school processes should be time efficient and managed to support teachers, students and families”. This is consistent with the Department’s Curriculum planning and programming; assessing and reporting to parents and caregivers K-12 policy. Senior Executive: Consult with head teachers and teachers to develop explicit, consistent, systematic and clearly articulated negotiated whole-school processes that align with policy standards and NESA requirements for HSC credentialing, and staff and students’ needs, including students with disability. 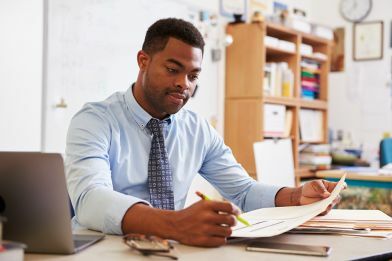 Head Teacher: Engage in and contribute to consultations and implement, with appropriate support, the negotiated school processes and procedures, including record keeping. Teacher: Engage in and contribute to consultations to develop negotiated whole school processes and procedures. The guidance material also sets out the responsibilities in terms of provision of support with a particular focus on “supporting teachers who are developing confidence in the delivery of HSC courses”. In terms of record keeping, there is recognition that the list of records required to be kept should be maintained and held either centrally or in faculties. This may include “a folder that is readily accessible, but needless duplication should be avoided”. The material to be kept may include “links to web-based records (such as NESA documents) or master records held in schools such as course-based attendance (if available through school’s electronic systems) to avoid inefficient duplication or unnecessary creation of hard copies”. If members have concerns regarding HSC monitoring processes within the school, the matters should be raised with the Federation Representative and/or the Federation Workplace Committee in the first instance.